Football (soccer) is one of the most popular sports at Suncoast with a wealth of opportunities for students to build their skills in and love for the world game. Opportunities include Football Academy, SCISSA Soccer and our Federation Club, Suncoast FC. The aim of Football Academy is to provide students who have a love for football, an opportunity to develop their game skills and to expose them to all facets of the world game, in order to provide a genuine career pathway. Suncoast Football Academy is open to students of the College who would like the opportunity to improve their football ability and awareness while completing their Queensland Certificate of Education. The program is designed to help students achieve and propel themselves to representative levels if they so choose or to consider a career in football. The Suncoast Christian College Football Academy program is designed for Year 4 – 12 students and provides them with opportunities to develop their football skills while being coached by elite and dedicated coaches. Our highly qualified coach, Mr Scott Grimshaw, provides a polished, challenging and structured program that will recognise the individual ability of each student. Scott Grimshaw is one of the most credentialed football coaches in Queensland. Suncoast Christian College has its own football club – Suncoast FC which competes in the Sunshine Coast Football (Federation) competition on Saturday mornings across the Sunshine Coast. 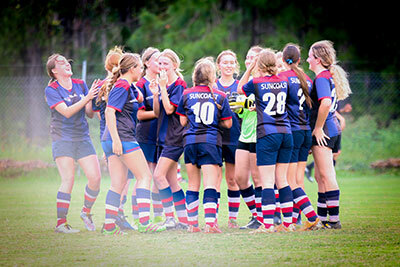 Suncoast Christian College is a member of The Sunshine Coast Independent Schools Sports Association which means that our students participate (during the winter months) in regular competitive soccer games with other Independent schools in our region. If you love football, the Suncoast Academy can help you on your way to a professional career in the World game.